This is a USB flash drive. It was designed by 5.5 Designers, Vincent Baranger, Jean Sebastien Blanc, Claire Renard and Anthony Lebossé. It is dated 2009 and we acquired it in 2012. Its medium is aluminum, integrated circuit. It is a part of the Product Design and Decorative Arts department. This is one of three USB flash drives designed by 5.5 Designers and manufactured by LaCie in 2009. The family of drives takes a playful approach to the design of a technological object. The USB flash drive (also known as a thumb drive, jump drive, key drive, or memory stick) is a miniature, portable data storage device that includes a flash memory with an integrated Universal Serial Bus (USB) interface for use with computers and other devices. The USB flash drive was invented in 1999 and became commercially available in 2000. As of 2012, the technology has advanced to the point where these small units can hold many gigabytes of data and have almost completely replaced the once-ubiquitous computer disc as a means of storing and transferring data. These digital tools are routinely relied upon to save and transport information, including documents, images, and medical data. Unlike many flash drive designs that are often characterized by bulky or elaborate "high tech" housings, 5.5 Designers chose to produce flash drives that look and feel like actual keys, pierced to fit on a key ring. The humor in the play on words and object form is taken a step further in the names for the different models: iamaKey, CooKey, and itsaKey. Each form, made of sturdy aluminum, is a distinct shape and has a different amount of memory and security features. 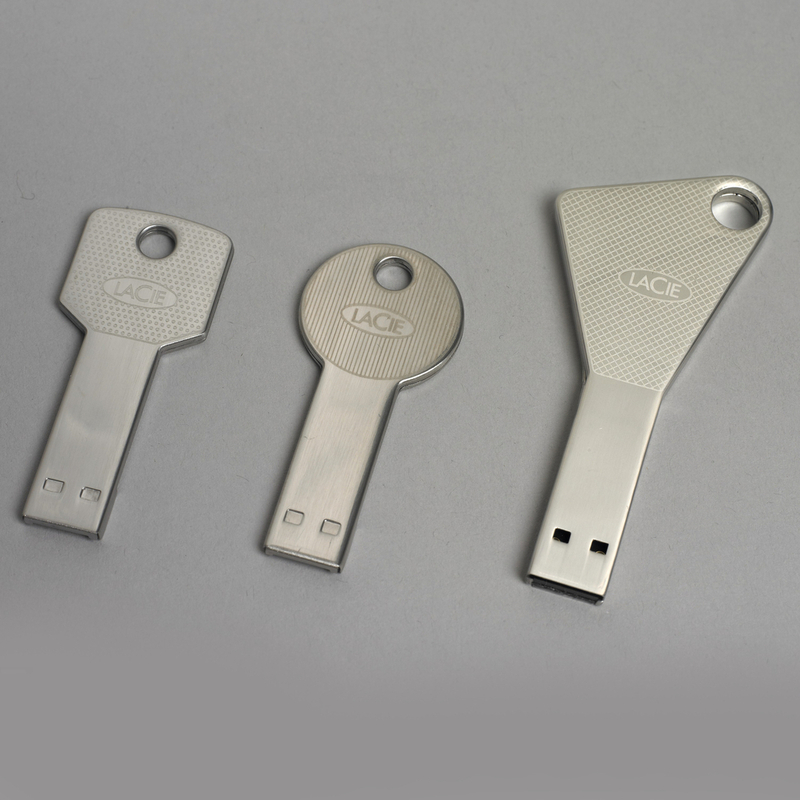 In a play on the association of keys with security, LaCie refers to these USB flash drives as “The Key to Total Security” because the USB connectors are both water- and scratch-resistant and any information stored on them can be encrypted. 5.5 Designers and LaCie have combined design and technology to produce witty, function-driven objects. These key drives, a gift from the manufacturer, would be the first of their type to join the museum’s holdings in the area of computer and digital design, a collecting area that continues to grow as innovative digital technology and design evolve. The forms also relate to the museum’s large collection of historic keys and locks from the 16th through 20th centuries, which includes examples in metal and other materials produced in Europe, the United States, and Asia. This object was donated by LaCie. It is credited Gift of LaCie.